A few months after making the stool and if I’m honest, feeling pretty disappointed and disheartened with my efforts, I decided to make something else using mortice and tenon joints to try and improve my skills. What to make…? I realised my Dads 70th birthday was coming up in a couple of months, so I thought I would make something for him. Thinking cap on I eventually decided on a coffee table, what could be easier, right? Without a design, just an idea, I researched what wood I’d like to build it from. I decided that it would definitely have to be a hardwood as I wanted it to look as nice as possible and last a long time. 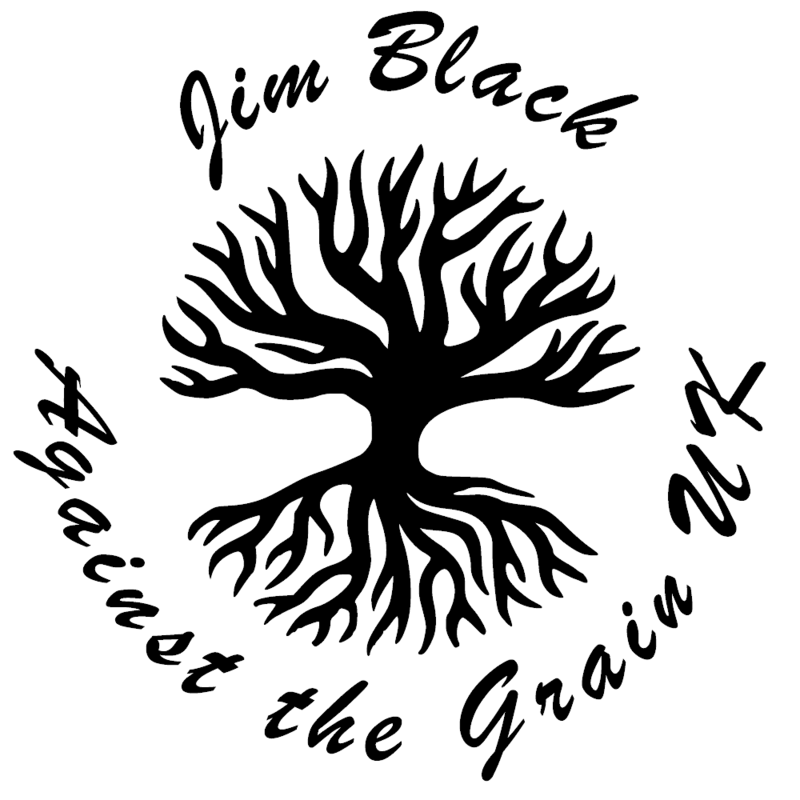 So I contacted local wood merchants and some not so local and chatted with a few people about the best wood to use. I eventually decided on Oak, for a number of reasons; it’s very hard wearing, doesn’t warp too much, it is fairly easy to get hold of and looks really nice. So I went to my local oak supplier, and when I say local I mean 2 miles away which is a real bonus as I could collect the wood myself and save on delivery charges. 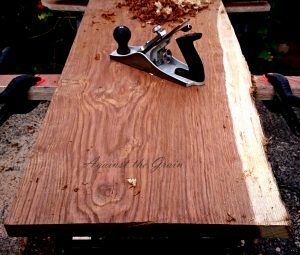 I chatted to one of the sales people and we discussed what sort of project I was doing and the amount of wood I would need for it – they could get hold of some slabs of 1 inch thick, 8 foot long and 2-3 foot wide, live edged boards – perfect for a table top! I also managed to get a few offcuts thrown in to make the legs and skirt from. They asked if I wanted it cut to size and planed at a cost of £80, which of course I said no to. The wood was already costing me more than it would to buy a new one from a well-known oak furniture shop! S o I placed my order and went away still trying to finalise my design, which had changed again after visiting the supplier. 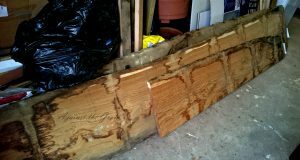 About a week later I got the call to say my order had arrived, so I jumped into the car and drove to the mill to be confronted with 3 of the largest slabs of wood I had, up to that point, ever seen! So boot open, car seats down, the warehouse supervisor brought my wood over with the forklift, looked my car, looked at the amount of wood on the forks and then at me quizzically and asked if I’d rather pay for delivery? “Not thanks, not at £45 for 2 miles!” So he shrugged and we proceeded to load the car up – luckily the slabs just about fit into the car, slid across the folded down backseats and over passenger seat which I had fully reclined. I tied the boot closed as there was about a foot of wood overhanging at the back, climbed into the driver’s seat and slowly drove off, listening out for the sound of wheels hitting wheel arch as I went! Thankfully the very slow drive home was uneventful. I have to say when I got home I was a little disappointed as the wood was dirty, marked and unattractive, nothing like the planed wood I had bought from B&Q. It was very hard to see much potential in it as I stared and tried to imagine how it would look cleaned up and turned into a beautiful hand crafted table! Anyway after looking at the wood for a time, I finally got to drawing up a quick sketch of how I was going to make the table. I included a few dimensions, just because I thought I should rather than I thought I needed them! I selected a piece with a nice section of uniformly equal width and out came my table saw and a hastily erected support to hold the 6 foot of overhanging wood. I cut it to the size I wanted adding about 4” extra to trim down later on to allow for any mistakes. All I had to do was plane it flat… Now this took a lot more effort than I had imagined it would, not having worked on oak before I had no idea how much harder it would be to plane or how much wear it would be on my tools. I had to re-sharpen my plane a lot, which was something I hated doing as it took me an age to get it right! So after a several hours of hand planning, sweating and swearing I could finally see how beautiful the wood looked. I’d take a break and just stand there looking at it, how the grain ran and how the live edge was a different colour from the rest of the wood. I got the top to a reasonable level of flatness and finish with my hand plane and decided to move onto the legs. I’d read a couple of books on different ways to do this and I opted for a skirt frame to incorporate the legs using my not so favourite joint, the mortice and tenon!